The BBR® HiAm CONA parallel strand stay cable system is the best product in the international market place. It has the highest capacity, most compact and widest range of anchorages available up to 217 strands. The BBR HiAm® CONA® stay cable system can be used for cable-stayed bridges, arch bridges and roofs. It fulfills latest international standards and recommendations including fib Bulletin 30 as well as PTI and Setra recommendations. This superior technology was developed and tested, and is continuously maintained by BBR engineers in Switzerland. Its superior fatigue resistance – “HiAm” stands for high amplitude fatigue resistance – makes it attractive for the most challenging of projects. Designers and architects have welcomed, in particular, the compactness of the anchorage and cable system, as it allows them greater scope to produce a structure which has sleeker lines and which appeals to the visual senses. 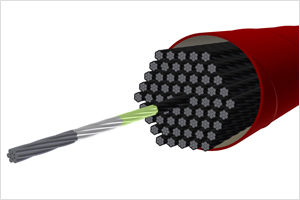 HiAm CONA cables are made up of a compacted bundle of a predetermined number of parallel seven-wire strands enclosed in a co-extruded (carbon black internal and colored external) ultra-violet resistant high-density polyethylene (HDPE) sheath of circular cross-section. 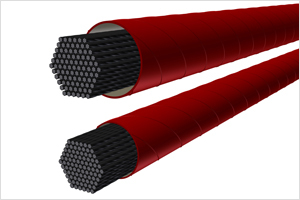 The individual strands generally have a diameter of 15.7 mm (0.62”), are of low relaxation grade, with nominal cross-sectional area of 150 mm2 and a minimum Guaranteed Ultimate Tensile Strength (GUTS) of 1,860 MPa. The strands are galvanized, corrosion inhibited and individually sheathed with a continuous and wear resistant HDPE coating, providing each strand with an individual multilayer protection system with three nested barriers. In the anchorage zone, the strand bundle passes a deviator and spreads out towards the compact socket, where each strand is individually guided, sealed leak tight and locked in the anchor heads with specially designed high fatigue resistant HiAm CONA wedges. Ring nuts screwed onto the anchor heads transfer the cable loads by contact pressure onto the structure (HiAm CONA Nut Head configuration). This anchorage type is particularly suited at the stressing-end of the stay cable where fine ± adjustability or future re-stressing is needed. Alternatively, monolithic anchor heads may be used to transfer the loads directly to the structure (HiAm CONA Uni Head configuration) where this anchorage type is best suited for the dead-end of the stay cable. In situations where there is limited accessibility at the anchorage zones, for instance in a narrow bridge pylon, the HiAm CONA Uni Head Short Socket can be used which offers an even more compact and cost economical solution compared to the standard Uni Head anchorage configuration without any compromise on performance. All BBR HiAm CONA anchorage components have been designed for a stress range greater than 300 MPa and to withstand the ultimate breaking load of the strand bundle with adequate safety. In addition to the standard anchorage configurations, a compact version is also offered which suits smaller openings in the bearing plate. The installation of the BBR HiAm CONA System is typically performed on site using strand-by-strand installation. 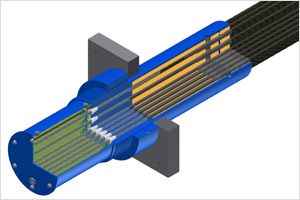 This is where each strand is tensioned immediately after installation, using the BBR ISOSTRESS tensioning method, ensuring an equal stress distribution among the strands of an individual cable. 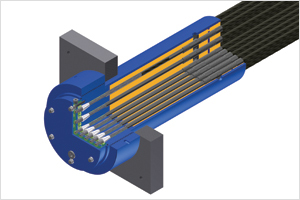 Alternatively to single-strand installation, fully or partially prefabricated cables can also be installed and tensioned using a multi-strand jack if access space is available. 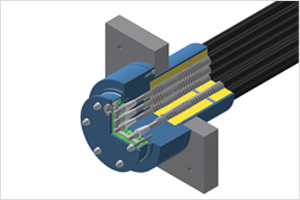 Each individual strand installed in a BBR HiAm CONA Cable System can be replaced at any time during or after the installation, allowing not only for a restressing, but also for the selective removal, inspection, replacement or addition of individual strands.